The People's Republic of China is situated in the southeastern part of the Eurasian Continent, bordering the East China Sea, Korea Bay, Yellow Sea, and South China Sea, and between North Korea and Vietnam, the total area of China is almost 9,600,000 sq. km. In addition to over 14,000 km of coastline, China has borders (app. 20,000 km) with Afghanistan, Bhutan, Burma, India, Kazakhstan, North Korea, Kyrgyz Stan, Laos, Mongolia, Nepal, Pakistan, Russia, Tajikistan, and Vietnam. China is mostly mountainous, with high plateaus, deserts in west, plains, deltas, and hills in east. In the southwest is the Tibetan plateau, often referred to as the "roof of the world" as it averages 4,000m in altitude. To the North West are a series of highlands and basins, and to the East lowlands, which are subject to widespread flooding. The highest point in the world, Mount Everest at 8,848 m, is located on the China/Nepal border. Rivers flow from west to east into the Pacific Ocean except a few in southwest China that flow to the south. The nation's largest rivers originate on the Qinghai - Tibet Plateau and thus have a high drop. 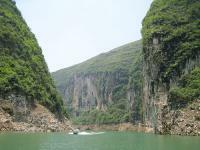 The Yangtze River 6,300 kilometers long is the largest river in China. The Yellow River, the second largest river in China, is also the birthplace of ancient Chinese civilization.